How does oppositional political positioning frame one’s view on such issues as healthcare, education, culture, religion and political power? In all of these issues, one finds very different takes on the individual’s role in society both in our relationship to each other and to the structures of government and law. The differences between the left and the right reflect primary differences in our cosmology, our vision of order and historical reference. A conservative, Thomas Sowell offers an insightful explanation of two conflicting cultural views he refers to as the constrained or tragic view and the unconstrained or progressive view. A constrained view sees that life itself, and particularly civilization, is fragile and tragic. Therefore, systems of civilization are inherently susceptible to trade-offs; what seems like an obvious benefit, i.e., free healthcare, has side effects possibly worse than the diseases it seeks to cure. If we have a government, it won’t ever be perfect, as the individuals granted the power to govern will, like all men, often behave selfishly in their own best interest. The unconstrained view sees humanity as malleable, and therefore perfectible. We must look to our ideals then, and our leaders who espouse them, to better ourselves and our society as a whole. The constrained view seeks to limit the power of governing bodies and any one person, respective of the inherently selfish nature of us all. Inequality and unfairness is a natural condition, this is why the weakest members of society warrant protection for civility to exist. The unconstrained vision would use government, education and cultural behaviorism techniques (nudging, shaming, rewarding marginalizing, coercing inclusion) to improve individuals and equalizing our outcomes. 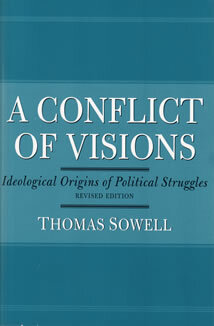 I agree that a conflict of visions accounts for differences between the left and the right. Notably, it is a way to understand why differing visions don’t simply disagree, but talk past each other because their assumptions are so different. An understanding of the two views is helpful, especially if you find yourself deeply entrenched in either view. Most importantly, the American political dialogue has stalemated into a reflexive response, grounded in opposition, in which neither side necessarily argues for the content of their position, but rather argues against their opponents frame of reference.Whether it be dismissive posturing because a conservative’s source of information is Fox News (or any source deemed conservative, based not on particular viewpoints, but tacitly acceptable as unreliable by whatever non-conservative sources say so) or that a liberal has been overly influenced by their college experience, or their youthful idealism (again, whether valid or not, it is the frame of reference that justifies the position, not the content of the reference), we are critiquing the book without ever reading it. All issues of the citizenry, healthcare, education, culture. religion and political power can be better understood through the lens of conflicting visions. But the lack of civil discourse, when it is found, is exacerbated by the oppositional stance taken when our conflicting visions lead to a failure to even hear one another. Let us look at the healthcare debate through the lens of Sowell’s conflicting visions. Healthcare in America is a mess and may be more accurately called Sickcare. For all of the knowledge, technology and wealth available, our health and well-being continues to fall way behind other industrialized nations in spite of spending more and more money. Healthcare as American’s know it now is neither government run nor at the whim of a free market. We’re somewhat in a transition heading towards more government regulation, but healthcare has never operated completely in a free market environment. The AMA (in their own words here, an alternate view here), who control much of how doctors get to be doctors and consequently a great deal of other healthcare related business, was founded in the early 20th century, long before much of what we understand as health care was even possible. Predictably, the left and right each have their own ideas as to what causes sickness and what the solutions to better health are. Generally, the left subscribes to the idea that we’re sick because we do not have access to healthcare. People succumb to illness because they have not been educated or are at a financial disadvantage to access healthcare. They look to European and Canadian models for governmental policies that would fix our healthcare system. Again, the left is liable to dismiss the constrained view that sees the tragedy and fragility of human life, and of how much our advances already benefit us, and sees that for any advances we’ve made, we are failing to provide equal access to all. On the right, they seek less government regulation and more individual responsibility and free market solutions perhaps by getting rid of health insurance altogether. The tragic vision seeks to simplify the relationships between health care providers and patients to limit the potential for corruption in the transaction. Seeing how opposite these views are at their root, makes it clear why there isn’t any way to enter into a discussion. Both sides recoil at any proposal offered by the other perhaps primarily because of differing visions of the underlying role that government should have in our lives. The answer does not lie in the perpetuation of opposing sides. I think many of us would agree, but, it seems we are stuck. The real tragedy as I see it, is the failure we all participate in by not finding a way to talk to and hear each other. Instead, we’re surrounded by powerful, and often times, corrupt people, and the affects of their financial and political power, which profit off of the polarization in the culture, and are perpetuated by an incredible barrage of information coming through an ever-present media posing as news, entertainment or education.